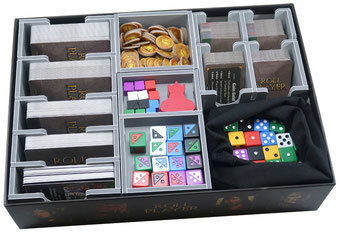 We have created Folded Space to bring to you board game organisers which will change the way you store, transport and, most importantly, play your games. 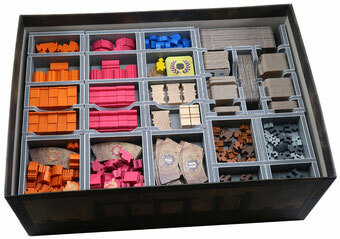 We have made the inserts functional through careful design and rigourous testing for game play and storage. Each design has been through several versions, to ensure fast game setup, quicker game-play and clearing away, and secure vertical storage. Our board game inserts use a lightweight material, Evacore, that is new to the board game industry. This innovative material is 5mm thick and is composed of a layer of flexible foam to which two layers of colour printed card are laminated. The resulting Evacore sheets are robust, flexible, can be cleaned with a damp cloth and are precision cut. These accessible mass-production processes produce an affordable insert. The sheets are die cut using molds prepared for each of the board game insert designs we have developed. These methods allow us to bring an individual insert to you at a very competitive price. You will receive a card box containing a number of cut sheets of the Evacore material. The trays are easy to punch out and are fun to build using everyday PVA glue. Easy-to follow instructions are included.